Kelly Gentry teaches Introduction to Visual Arts (ARH 151) for non-majors. She received the MA in art history in 2016 from the University of Alabama at Birmingham, with a major concentration in modern American art and a minor focus in Renaissance art. Her thesis was titled “Symbols of Independence, Love, and Sorrow: Georgia O’Keeffe’s Skyscraper Series.” Gentry volunteers at the Birmingham Museum of Art as a gallery attendant, answering visitors’ questions about the artwork and engaging visitors in conversations about art interpretation. As a graduate assistant at UAB, Gentry taught The Art Experience and Early Modern to Contemporary Art. 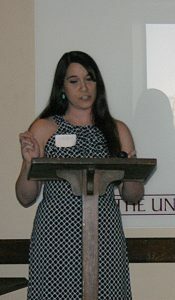 She presented her research paper, “O’Keeffe’s Skyscraper Series: Symbols of Power and Social Independence,” at the 20th Annual Graduate Student Symposium in Tuscaloosa. She also presented her thesis research at UAB’s campus-wide Graduate Research Days in February 2015.